Mary Lou Jepsen’s keynote presentation of One Laptop Per Child at our Greener Gadgets conference a few years back was without a doubt one of the highlights of the event. The OLPC laptop, known as XO or the $100 laptop, is a feat of energy efficient engineering, consuming just 2W of energy – which enables it to be powered through solar cells or hand cranks. In the video above, Mary Lou illustrates how the XO laptop is a new model for energy-efficient electronics, and inspiration to look at new ways of powering our devices. I think it's awesome that the PixelQi company was created so that U.S. citizens can benefit from this technology as well. Saving power and reducing the U.S. dependence on oil in any way we can will help globally, not just help the U.S. citizens that use the technology. The XO laptop as a rugged E-reader that can supply entire libraries of books and information to people of all ages can and will improve the world as a whole regardless of where it is used. In fact, just make it a goal for everyone to eventually get one. Someday we won't know how we did without one. Education promotes rule of law, which promotes a stable country where hard work can pay off for an individual. I am especially excited about the interconnectivity technology of the XO. I only wish the WiFi standard was as flexible. I have seen the pixel Qi display for sale in the Maker Shed, but I have not yet discovered if the networking system is for sale. I hope it is. I have seen a lot of hand crank dynamo's, but they all seem to be missing a key feature: a wind up spring. Why should a person or animal crank for 20 minutes when they have the strength to wind up a spring in 20 seconds that can spin the dynamo for 20 minutes? I hope that the PixelQi company can manufacture the kind of dynamo I have described for use in powering a variety of handheld devices as well as the XO. Haineux-- Why are you parroting the inane complaints of 'Other Reviewers' If you'd ever actually read the website, you'd understand what this machine is for. It's a learning machine.... for kids.... What you and your 'other reviewers' consistantly miss, somtimes quite intentionally, is that None of the XO series is supposed to be a general purpose device. An XO, pound for pound, dollar for dollar, is the most effective teaching device ever devised. And the tougher the general environment is, the more effective it gets. The FUD your throwing around is the Wintel Combat slogan that has been bedeviling this project from it's inception. It's NOT SUPPOSED to run Windows. It's SUPPOSED to run a Free, Open Sourced, Globally supported OS dedicated and optimized to run Sugar. Sugar, is the best design of the best minds on the globe. It is a Particular, Special Interface environment for helping KIDS... LEARN...EVERYTHING and NOT learn Computing first. Technically, Sugar is a 'shell' over a very small, customized, optimized Linux kernel. not unlike a 'Distribution'. such as Ubuntu or CentOS. Sugar can be programmed by anybody that knows how to write an outline. Sugar is for delivering concepts to kids. the XO is for delivering Sugar. It's not an Office, or a Multimedia, or ar 'Web Experience' machine. It's the Best We Can Do for an interactive teaching process encompassing Cross Cultural, Basic, Human learning acceleration. BTW, there is an excellent 'Groupware' type function in Sugar that includes a competent Email client. If you saw it, you'd like it. And, Yes, it has a very competent browser that will support just about any web service you want. If you want a geekish comparison, Google Chrome is an evolution of that codebase. If you had any idea how much money Intel has spent to kill this project. Simply because it was originally designed with an AMD processor. Or how much money Microsoft has spent to kill this project because it does not run windows. The Wintel Cartel has bought and still buys Ad companies, Lobbyists, Lawyers, and been alleged to have bought not a few Government employees, up to and included Ministers to block this project. The entire 'Netbook' revolution was spawned as a competitive response to the disruption that demonstration of cheap, effective, potentially ubiquitous access caused. If you had any idea of the amount of money Asus spent in crash developing the EEPC. Specifically to compete. Or the tactics Microsoft used to squash the Linux distribution originally intended for the Asus platform. (This even before people discovered that the User Interface Asus shipped was half baked) If you heard the Indian Minster of Education reject a proposal to distribute the XO because "It does not teach our children the skills they will need in the workplace". Meaning of course, that it's not a Microsoft training program... Imagine, a machine designed to help teach math to nine year olds in deserts, fails to be a training platform for Excel. It teaches Language, Communication, and Critical Thinking, but doesn't teach Microsoft Word. The Planet might not grow up to be Plug 'n Play Microsoft compatible. Gee. Why do you throw that $425 number around without explaining where it comes from. G1G1 ( Give One, Get One) was 2 Units. $199 each. the one You got, you paid shipping for via Amazon Storefront. The one you gave was delivered free as part of a serious initiative. Anyplace. You would STILL be hard put to find a machine of comparable specs for that money. 3 years later. If you bought one for your kid thinking it's a cheaper gaming and homework (snicker) machine than maybe an Acer Inspire, You deserve what you got, An XO, with support, can help deliver an Excellent Education experience. If you can teach with the tool, do that. If you were looking for an alternate babysitter when the TV don't work. You screwed yourself. BTW, it runs Kubuntu quite nicely. With Flash 10.1. $100/unit was, and is a slogan, but a serious slogan. the XO1.5 is still $199 in the U.S. and is just about double the performance of the XO. In it's current configuration, it's an obviously better value than any of the other current comparable netbook class devices. The Series will get progressively more value with development. BTW, if you look around, you will find hacks to run windows XP on an XO. Why you'd want to, is beyond me. If you want to act like you know what your talking about. Find out what your talking about. Ravindranath: See Above. India has rejected the XO. Twice. Once nationally, and Once by refusing to allow National Allocations to be used in Maharashtra after it was approved in Assembly... twice. I'd suggest you find out why. I'd expect you won't like the answer. Archwork: Your Ignorance is terrifying. Kids don't buy XOs, Governments buy XOs. XOs come with a plan. and Infrastructure. Support, deployment, Training, Curriculum, Teacher Recruitment and Education. Courses, Content. The Mission and Purpose of OLTP, using XOs, it to absolutly maximize the effectiveness of the most critical component in an educational system. Human Capital. Teachers, Administrators, Researchers, Legislators. Machines are cheap. it takes about 8 minutes to make one. Good teachers are not. It takes about 22 years to make one. Poverty stricken kids become poverty stricken adults. Until, and unless you break the cycle. XOs are not teachers, They are tools. They are Good tools, they are often the Best tools in challenging environments. You got a School district. Maybe Inner City like say Nairobi. Or Rural like say most of Egypt. 5-10,000 kids, half of them Grades 2 to 8. In either case, the Teacher/Pupil ratio is about 1 to 500. Deliver a few servers and 5-10,000 XOs with a 4 year service life to equip 5-10,000 kids a year for 4 years. Or, try to deliver Books and consumables for the same grades over the same period? What kind of savings is there in delivering a 3 times more effective learning experience using 1/3 the manpower? Quit thinking that all kids everyplace get taught the same way American kids do. An American kid chews through 450 Pounds of paper pulp a year. You wanna try to air drop that into Yemen? Average class size in the U.S. is about 30. possibly less. Your tiny experience here just does not translate. BTW. it doesn't appear that your school system served you well atall. I don't suppose you got the news abut how 38,000 Windows Notebooks, were provided by the US government to School Systems in Iran, and how all 38,000 disappeared off the Freight Dock. And how not one person was ever indicted. Had they been XOs that would have been MUCH tougher to pull off. Nano: See above. An XO is not a PC. and it's not effective standalone. It's not supposed to be. Organize your School System. If you're dedicated, Contact Catholic Charities. They occasionaly run redistrubution programs. In the mean time, Your local Library probably already has workstations donated by any of a number of groups, Likely the Gates Foundation. very great but there must be better ways to charge it in india than animal exploitation. anyway i'd buy it. When I am elected president, Mary Lou Jepsen will be my technology adviser. What about other candidates? Very impressive. A more compelling argument could be made if the presentation were given using an XO laptop instead of the power-guzzling one that is used in this video. how does one buy a laptop? Amazing what happens when our minds focus on helping people over profit potential. Let's see now, are there any other products that we manufacture and consume en masse that are overly hard on the environment.... hmmmmmm.... oh yeah! all of them. New paradigm? 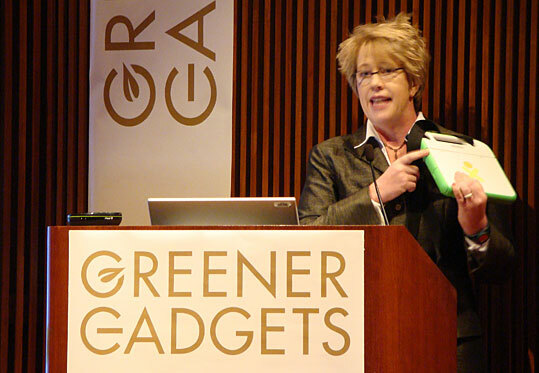 Mary Lou Jepsen's keynote presentation of One Laptop Per Child at our Greener Gadgets conference a few years back was without a doubt one of the highlights of the event. The OLPC laptop, known as XO or the $100 laptop, is a feat of energy efficient engineering, consuming just 2W of energy - which enables it to be powered through solar cells or hand cranks. In the video above, Mary Lou illustrates how the XO laptop is a new model for energy-efficient electronics, and inspiration to look at new ways of powering our devices.